Millions of Americans will not be able to afford to retire. Millions more will barely be able to retire. And still millions more won’t be able to afford to retire, but they’ll go ahead and do it anyway. That’s why you may need to sell your house to retire. This is a suggestion that I made in What to Do if You Cannot Afford to Retire. It must be reemphasized as a standalone strategy. For millions of Americans, their house is their single biggest asset. For that reason, it may need to be sold. I realize that this suggestion goes against the cultural norm. People are taught to buy a house, and then keep it at all costs. I completely disagree with that mindset. There’s a time to own a house, and a time to sell it and move on. If retirement income and assets will be limited, selling your house may be absolutely necessary. The Internet is overflowing with articles and videos preaching the gospel of saving for retirement. It’s absolutely the right strategy. However, not everyone is in a position to save for retirement. Many people who are can only save the bare minimum. There’s no debating this point – it’s a fact. According to a study by the Government Accountability Office (GAO), 52% of all Americans have no retirement savings. It’s not a stretch to say that many who do have retirement savings have no more than a few thousand dollars. Here’s an even scarier statistic…A 2016 study by Go Banking Rates showed that 69% of Americans have less than $1,000 in savings. Within that group, 34% have no savings at all. Only 31% of Americans have at least $1,000 in savings. That includes people who have anywhere from $1,001 and up. Even if it’s $5,000 (or $10,000) it’s still not much given today’s price levels. If you’re in this group – which is the decided majority – and you own a house, it may be your single biggest source of potential retirement capital. If you’re serious about retiring, you may have to sell your house do it. It may even be impossible to retire without doing it. One of the most tiring phrases I’ve ever heard is I have to stay in my home. Really? Even if you can barely afford it? Even if you really can’t afford it? That’s not the brain talking – it’s the emotions. And emotions should play no role in dollars and cents decisions. Emotions will usually cause you to make the wrong choice. I’ve seen dozens of people living at, below, or just above the poverty line, while having six figures in equity in their house. It’s usually the elderly. They’re hung up on that I have to stay in my home thing. Why? Because I have to. Oh, no further questions then. If you’re old enough to remember the TV show The Beverly Hillbillies (start watching this video at the 20:00 mark), then you might remember the first episode where Granny – and her rocking chair – are loaded onto the back of the truck so the family can move to Beverly Hills. It was the only way to make her go. So it is with many of the elderly today. If you’re truly able to retire comfortably while retaining your home, then it makes sense to keep it. But if you’re on the edge of poverty, it makes no sense whatsoever. There’s usually no practical need to struggle in retirement when you have substantial equity in your house. It’s a self-imposed prison. This is one of the primary reasons why you may need to sell your house to retire. If you’re a single person, or a couple, and you’re living in a house with three or four bedrooms, you’re paying for space that you don’t need. That includes higher property taxes, higher utilities, and even more repair and maintenance expenses. Generally speaking, the bigger the house is, the more it will cost to keep. It’s even worse if you have a large piece of property. Sure, you may be able to mow the lawn, trim the hedges, rake the leaves, clean the gutters and shovel snow when you’re in your 60s and in good health. But will that still be possible when you’re in your 70s or 80s? The problem with waiting until you can no longer take care of the property is that you get set in your ways. This is another trend that I’ve seen many times, we all have. You stay in the house until everyone you know is fully aware that you don’t need to be there – except you. A friend of mine, speaking of his own elderly mother, said that most people stay in their homes 10 years longer than they should. I think that’s right. He didn’t make that up either. He was told that by a senior care counselor. His mom was in her 90s, was declining, and needed to be moved into a facility. She resisted for years, at her own peril. I’ve seen it play out with my own mother. After my father died, she insisted on staying in the house all by herself. Her cost to keep the house was rising every year. She had to pay contractors to take care of everything. Her property taxes and insurance were going up every year. But she insisted on staying. My sisters and I practically had to engineer a bloody coup to get her out of that house. That’s one of those times when you realize how the parent/child relationship changes 180° when the parent gets old. Ironically, within a few months of finally leaving, she admitted that she stayed too long. Insisting on staying in the house was her emotions speaking, not her mind. Only once she was out of the house could she see the absurdity of continuing to live there all by herself. Like many of the elderly, she was completely over-housed. She was paying for that condition with no practical benefit. She was even endangering herself by living alone. Just because a house made abundant sense when you were raising your family, doesn’t mean it’s a necessity when you move into the retirement years. You should have fewer housing needs, enabling you to live more lightly and inexpensively. You absolutely should take advantage of that benefit. One of the most compelling reasons cited for homeownership is the tax deductibility of mortgage interest and property taxes. But if your mortgage is paid off you no longer have an interest deduction. Under the tax code, you’re entitled to take the standard deduction of $6,350 if you’re single, and $12,700 if you’re married filing jointly. If your mortgage is paid, and your real estate tax is lower than these thresholds, you’re not getting any tax benefit from owning your house. Even if your mortgage interest and real estate taxes are slightly above the standard deduction, you may not be getting the benefit you think. If your marginal tax bracket is only 10% or 15%, it’s not any kind of a windfall. For example, let’s say that your mortgage interest in real estate taxes come to $15,000 per year. You’re married filing jointly and you’re in the 15% marginal tax bracket. Now in real estate agent-speak you’re getting a tax break of $2,250 ($15,000 X 15%). But that’s entirely wrong. You’re actually getting a deduction only on $2,300. That’s because you would be able to take $12,700 on the standard deduction anyway. The only portion of your mortgage interest and property taxes that are actually deductible are the amount that exceeds that deduction ($15,000 – $12,700 = $2,300). If you’re in the 15% tax bracket, that translates to an income tax savings of just $345 per year. What that means is that you really don’t have a significant tax benefit from owning your house. This is a common situation with people who are retired. That’s because when you’re living on a reduced income you generally have fewer deductible expenses. For most people who are retired, the tax benefit of owning a house is either minimal or completely nonexistent. This is a non-financial factor that could prove to be strategically important. Once you retire, you’ll no longer be tied to a specific geographic location. Absent a job, or at least a career type position, there may be no economic reason to stay where you currently live. You might want to move to a less expensive location. There may be another location that’s more conducive to the kind of work that you want to do after you retire from your current occupation. Your children and grandchildren live in another state, and you want to move to be closer to them. You want to move to a place with a better climate or better recreational amenities. You’re not sure you’ll be able to keep your home on a reduced retirement income. You’re over the extra work and responsibility that comes with homeownership, and you just want to move to an apartment or condo. You simply want to be free to move to wherever you please. Homeownership is often an attempt to gain permanence. But the reality is that nothing in life is permanent, including life itself. Homeownership may prove to be an anchor that’s no longer worth keeping. You may have needed a stable home to raise your children in. But do you also need that for yourself? Let’s get into the most practical reason to sell your house to retire. Let’s say that you have $50,000 saved for retirement. It could be $10,000, or it could be $100,000 – whatever the amount is, it’s clearly not sufficient to enable you to completely retire. Now let’s also say that you have a house that’s worth $300,000, and you own it free and clear. It may be comforting to know that your house is paid for, and you can live there mortgage-free in your retirement years. But if you have little in the way of retirement savings, it may be better to sell the house and cash out. If you sell the house and walk away with $300,000, you can invest the money and even begin taking withdrawals against it. Using the safe withdrawal rate of 4% you can withdraw $12,000 per year ($300,000 X 4%). That’s $1,000 per month. In theory at least, if you have a well-balanced retirement portfolio, you can withdraw 4% per year for the rest of your life, and never outlive your money. You can even bump that number up higher if you are older, like 70. You won’t be able to retire on $1,000 per month, but if you will also be collecting $3,000 per month in Social Security (we’ll assume you’re married and both eligible), your income is now up to $4,000 per month. That’s a much more credible number. And if it isn’t, you can always work to supplement that income. Earning an extra $1,000 or $2,000 per month would likely give you a comfortable semi-retirement. This isn’t a perfect strategy of course, but perfection is not the goal. It’s about successfully working within the constraints of limited options. Contrary to popular belief, you can almost always find a less expensive place to live – especially if you are retired. Many people who retire specifically move to lower cost areas for that reason. Since you will no longer be 100% job dependent, you can live in a place that has fewer jobs and a lower cost of living. Even if you continue to live in your paid-off home, you still won’t be able to live “rent free”. That’s a myth. You’ll still have to pay property taxes, homeowners insurance, utilities and repairs and maintenance. Should you decide to move into a rental situation, you’ll only have to pay rent and reduced utilities. The repairs and maintenance will be completely gone. The bigger benefit is that you will have transitioned from a very modest amount of retirement savings – maybe $50,000 – to a much more substantial $350,000. Even that may not be enough for you to fully retire. But it will definitely open up a lot more options. In today’s America, retirement is no longer certain. If you hope to retire on limited resources, you absolutely need to think differently. In many cases, this will require making radical changes. That may include selling your house to retire. If that’s the case, then you it needs to be considered. It’s not a bad thing – it’s just different. Have you thought about selling your house to retire? As I never had the financial ability to gain homeownership ( tried 3 times), I may be a bit off in my view. If I had achieved homeownership, I would have planned to pass the home to my children to dispose of or keep. Because I didn’t get ownership, I changed my plans to how I would live out my latter years. Too many older individuals are left alone, .Parents are not an afterthought. If the children left the neighborhood to upgrade themselves, great, but overtime, something has to be planned for parents situation. Hi Maria – I’m so glad you brought up that strategy (living with your kids). I didn’t want to suggest it in the article, since today it’s just assumed that everyone will live in their own separate space. But a room with your kids is a good arrangement. It gives you a stable place to live, and your kids help paying expenses. That said, two things parents in that situation MUST do. 1. They must contribute financially. Even if Soc Sec is all you have, giving some of it to your kids is the right thing to do. It’ll be less than you’ll pay elsewhere, and it will help your kids to maintain the house/apartment. 2. Parents have to “go with the flow”. They can’t expect the kids to change their lives to accommodate them, esp if the kids have kids of their own. The parent can’t move in then reassert the parent role. The dynamic will have changed completely. I actually toyed with the idea of taking my mother in to live with my family. But my sisters argued against it. My mom was never one to go with the flow, preferring to be the dominant. (Our family joke was always “there are two ways to do things, Mom’s way and the wrong way.) She’s the type where if you were going to take care of her she’d tell you exactly and precisely how you’re going to do it. Needless to say, we didn’t take her in. It was for the best. She doesn’t play well with others. There are a lot of advantages to this arrangement. For example, a parent may be able to “earn their keep” by taking care of their grandchildren or helping with work around the house, which is a major plus in a dual income household. The kids will be there if the parent has a medical problem, at least to call 911. And there are a lot of benefits to multi-generational living arrangements, though our culture today largely dismisses these. I believe that as economic conditions weaken in the years ahead, communal living arrangements of all kinds will come back into favor. Not by choice, but by necessity. Our kids are getting to the point of moving our on their own. But my wife and I realize that we need to keep a large enough living space to take in at least one “boomerang kid”, and maybe a spouse or child(ren). The cost of everyone having a separate living arrangement is getting more prohibitive all the time. I realize most people scoff at this idea. But as I said, it will be dictated by necessity not choice. It’s likely that the next recession will fast forward the process. Thanks again for bringing it up Maria, I was thinking about it all the while I was writing the article. I totally agree that if you can not afford to keep up with the maintenance for a home, you should sell so you don’t lose market value. We bought small 16 yrs ago, to have smaller utilities, house payment, taxes, and insurance. I am paying the same as a nice rental place yearly until something breaks down. I see myself as not wanting to do upkeep after 62 so I will have more energy to keep a job. My children do not want to own a home so my option of moving in with them is slim, but I would love it. My mother moved in with us 10 yrs ago. I have been researching areas with apartments close to shopping, hospitals and transits services to stay independent as long as possible. Maybe as the years go by, one of my children will have room. Hi Deb – That’s an interesting observation about “have more energy to keep a job”. One of the things I’ve noticed about getting older is that you don’t have as much energy as you did when you’re young. It means you have to seriously prioritize what you need to do. Where I might have scheduled 6-7 unrelated tasks in one day years ago, I’m now down to 3-4. I find that I’m better able to complete what I need to when I have fewer tasks to do. We live in a condo now so I don’t have to worry about exterior maintenance. That gives me more time to be productive with work, and it makes a difference. Time management becomes more important as you get older and your energy level declines. Owning a house is another energy drain. I’m thinking that since you moved your mother in with you, one of your kids might do the same with you one day. But as I said in my response to Maria Rose, communal living will be forced on us. So don’t give up hope of moving in with one of them. During the Great Depression people frequently took in boarders to help with expenses. In the future they may take in family members. I really see that happening. 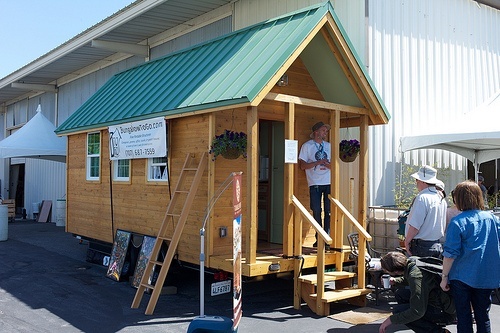 Failing that, the “tiny house” concept seems to be gaining popularity. That’s why I used a picture of one for this article. It’s an alternative living arrangement, and one that’s a lot less expensive. It’s not for me, but for some it works. But a lot of things are going to change going forward so we have to be open to anything. Whether forced into a communal living arrangement or agreed upon, what I was trying to present was an alternate living arrangement. I just read the other day that in certain states/ cities there are constructive settings bieng built to accomdate those who tend to like a bit of separation but want to be part of a commuity. these communities are either a group of houses in a gated community where everyone pitches in to help others or an apartment setting with a big open community setting (full kitchen, dining room, activity room,etc.) with private sleeping areas which include a small kitchenete (burner top and small frig)similar to studio size apartment. I have seen too many elder people n my area who live by themselves who have very little contact with family. We all have had problems with our parents, especially when that parent wants to be the one in control, but one of the children needs to be close enough to keep check on them. I,myself, had to move in, for a few years because of lossing my apartment to fire, with my sister and her family, where my father was living, in the second home my parents brought. When you are in a shared situation, everyone needs to contribute financially. I paid a contribution plus had an unexpected expense of paying their unpaid utility bill when they left my father home alone. I paid the bill to take care of my father. Both my parents lived thru the Great Depression, so we always had some relative living with us. If I had a big house,, like the one my parents had in the Bronx with 3 separate setups for apartments, I would have spent the money to create the three distinct apartments rather than the in law open setting. That way, any income , I got from rentals wound pay for upkeep by a trusted contracter. But after a certain age, a big house with many rooms and staircase and big yard is unnecessary, especially if living there alone. As I said, I just want enough room for me,my books, my pet and kitchen privileges. My son lives with me and plans for me to be there even if he wants to move. We share the bills accordingly. I gave money to my parents when I lived at home as soon as I started my first job. I am merely developing the same tradition but minus the totalitarian rule. I would even consider the tiny house setting if I could park it in one of my kids driveway hooked up if they owned a home. Again none of us, are rich enough to survive on our own, we need any break we can get. Maria I got a chuckle out of “same tradition but minus the totalitarian rule”! I’d show it to my mom but it would go right over her head. (If she can’t be the dictator then she doesn’t want to live in your country!) I’m glad you’ve taken this thread down the path of alternative living arrangements. I thought to include that in the article, but it was already 2,000+ words. As well, I thought the bigger theme was to encourage giving up the current “traditional” living arrangement of homeownership. We never had other people living with us when I was growing up, but both my parents did. In fact, my father’s family took in his aunt and uncle for several years. In the process, his aunt became a second mother to him and a revered grandmother figure to me and my sisters years later. It’s interesting the positives that come from being open to change. We easily see the negatives, but seldom anticipate that unexpected good may come out of the unconventional. I agree we have to be open to options to our living arrangements in the future. My widowed neighbor sold her house to her daughter, with the right to live there until she dies. Another neighbor sold his house and built on to his son’s home, a bed and bath with a private entrance. Most apartment are at least 800 sq ft…just enough but tiny houses are under 200 sq ft.. I couldn’t do that. Severe changes are coming, I just hope they come slowly. I’m with you Deb, I couldn’t fit into 200 square feet. My office would take up at least half of that, and my wife would never stand for that. But it does help to be open to alternatives, and even to explore the different options. The Eagles had a song Already Gone, that has a line, …So often times it happens, that we live our lives in chains, and we never even know we have the key. I always try to remember that verse. It may be a song, but it’s 102% correct. Most times we’re trapped in a jail of our own making. Life’s tough enough without being our own worst enemy. I have owned one single family home in my life. I’m 53. I lasted three months in it and sold it. Just about my entire adult life I have lived in two, three or four unit homes. My current home is two units with my business also housed in it. My mother in law lives downstairs. We do not charge her rent but she cooks four nights a week for all of us. I strongly believe in this type of living. Once my kids are out and my mother in law has passed on I will not be here anymore. There’s no way I am going to force my kids to have to take care of me or worry about coming to fix my home when I can’t anymore. I’m going right into a rental. With my monthly taxes, water bill and home owners insurance I’ll pay just as much to live in a rental without the burden of fixing broken things or paying school taxes or property taxes. Let someone else worry about that. I want to be mobile. If I want to leave for three months I just want to shut the door and leave. When I get to old for that then maybe I can live with one of them or go to assisted living. Whatever the case I will not own a home past the point of it being a boat anchor. Which it is now but I can still handle it. Hi Tim – You’re describing the situation of a lot of retirees who live in high cost areas. They pay off their mortgages, but the taxes, insurance and utilities are higher than rents in the same area. Paying contractors for repair and maintenance work is also high in the same areas. I suppose that if house prices are low where you live it might make sense to continue owning, but that situation can’t be guaranteed anymore. When my wife and I moved to Atlanta in 1993 housing was dirt cheap. But it isn’t anymore. Not only are house prices high, but so are property taxes (government always needs more money). I really do believe that renting will be better for most retirees. Millionaire James Altucher doesn’t own a house and makes a compelling case to never own one. I don’t agree with never owning a house (there certainly is a time), but when I see someone brilliant like Altucher making this point I know I’m on the right track. But your point about mobility is also a compelling reason. I know it is for me. Hi Marissa – That’s the article I just linked in my comment to Tim. Yeah, Jim Altucher has strong words against homeownership. I don’t agree in all cases. But Altucher is a free thinker of the highest order, so it’s a very interesting perspective. Of course, I love out-of-the box thinking so it resonated with me. But here in this article I’m focusing specifically on selling the house as a way to retire. It’s actually one of the best strategies, particularly for someone who has little in the way of other retirement savings. My personal feeling is that you should only own a house if it brings you income, which mine does. Also if it is part of your retirement strategy. Which it is. I also wanted to have some stability for the kids to grow up. Otherwise I see no other reason to own a home. My father’s generation look at home ownership much different than I do. He was the first guy in his entire family tree to own a home. After WW2 when became much easier for him as a veteran to get help with home ownership. He looked at it with a source of pride. Owning your own home was a source of pride for him. It meant you were successful. I think alot of people of that generation looked at it that way. I am not surprised that it is very difficult for them to let go of that. That’s an excellent observation Tim. A lot of people, particularly those born during of after WW2 think they’re naked if they don’t own a house. I actually get that, because when they were coming up in life owning made more sense than renting. A person earning $5,000 per year could buy a starter home for $10,000 that would be cheaper than renting. 20 years later they owned it free and clear. Meanwhile the value of that same house has rocketed to $300,000 after 30-40 years. What’s not to like? But the price structure is very different now, and it changes the dynamic. While the person buying in the 1950s and 60s bought a house for twice his income, it’s way out of balance today. Now a couple with a $75,000 income buys a house for $350-400,000, or about 5 times their income. Where the 1950s couple paid $200 per year for property taxes, today’s couple pays $6,000. And it’s entirely unlikely that the house bought today will be worth 30x more in 30-40 years. One of the basic components of wisdom is the ability to recognize change. Most people don’t and that’s why they get trapped. A house is an excellent strategy under the right circumstances (raising children, producing an income as you said). But what we have today is largely driven by group think and a sense of compulsion, both largely based on the “way it’s always been”, at least up to this point. But when you reach retirement age, change will come whether you want it or not. What’s worked up to this point could become counter productive, and that’s why we need to be open to change. quickly. My late sister is a prime example who became ill but couldn’t sell because she had used the majority of the equity for home repairs and luxuries. She now had a home she couldn’t take care of, no job, no equity, and no where to go. Long sad story. But had she been able to sell, downsize to a smaller place, there would have been money available for her care. It’s difficult to accept the aging process and the decisions that often go with it, but something we all have to face. I, too, liked what Deb said about having more energy to do a job or work productively rather than pour it into home maintenance. That’s a very good point. I also work long hours and the last thing I want at the end of the day is to mow all of our acreage and clean my house. It’s becoming too much. There are so many communities opening up now all over the country that give the aging population what they need without the headaches and I hope more people will consider them. I also agree with living with family if that works for you, but often times it doesn’t, as in your mother’s case. Everyone’s situation is different. Hi Bev – There are tough choices to be made as we get older. But that’s why it’s important to make them earlier, while we’re still in control. If you make a major move, like selling your house, in your 60s, you’ll have time to adjust to the change. It gets more complicated when you’re in your 70s or 80s, and you lack the mental, emotional, physical and financial capacity to change. That’s usually when a move has to be made for you, as was the case with my mom. It’s complicated for all concerned. We began advising our parents to sell and move when they were in their 60s, but they weren’t having it. After the episode with my mom my sister told us all not to allow ourselves to fall into that trap of waiting too long, and she’s absolutely right. Make the move while you can manage it on your own terms. That said, a lot has to do with personality type. Some people are more progressive in their lives, while others are relatively inert. The first group makes change proactively, the second is change resistant. The problems usually happen with the second group. That’s why I consciously try to position myself in the first group. The process of life is dynamic, and we make everything better for ourselves when we accept that reality and go with it. The inert group wants to believe that they can make change go away by ignoring it. It never works that way. More people are in the second group. They’re the perverbial frogs in the pot of boiling water. I know more of this type than I can count. I had to laugh when I read the link. I know how Jim Altucher feels. My husband and I have spent life renting then owning. The decision has to do with the situations at the time. Before buying, get a good home inspector to check everything out, or pay later. Luckily we did, and bought at a great time when rent was higher than a house payment. Renting on the other hand, takes a lot of research about the landlord and area but doesn’t make you feel “married” to the place. We have no regrets buying, but prefer to spend our free time together enjoying family and community with selling our house. True Deb, there’s a time and a place to own and to rent. My wife and I rent, and I feel free in a way I never did as a homeowner. But when our kids were young it made sense to own. I will say this, you can and will adjust to whatever your situation is. There’s virtue in both owning and renting. What’s important is that we do what’s right for us, and not be handcuffed by certain doctrines and beliefs. It did make sense in my father’s time to buy a house. I’m sure he never foresaw his 16,000 dollar purchase in 1962 go up to 120,000 in 2000. That is a great return. It just isn’t like that anymore. I agree with what you say. Really what we both have been saying on here. We can’t look at things the same as they we’re. I think a lot of us between 45 and 60 still make decisions based on a old belief system. The one my parents had. The one I was taught growing up. The one that doesn’t work anymore. Those of us who can adjust will be better off than those who can’t. My mother stayed in her home way too long also. I was trying to get her to sell and move to a condo back in the early 90’s. Same basic neighborhood. She could have sold her home for about 120,000. The condo was 70,000 at the time. She could have banked 50,000. Had a paid for condo with basically no upkeep. She lived alone. It made no sense for her to stay there. It caused such a rift with her and my sister. She just kept screaming that I was trying to throw her out on the street. My sister didn’t talk to me for 2 year’s. I saw this way back then. Instead she stayed until 2015, the place was falling down around her. She would not put a penny into the place. She ended up having to basically be thrown out. She could not take care of herself anymore. The house was a mess and my sister ended up selling it for 65,000 as is to an investor. It all could have been avoided. We get emotionally attached to stuff. Why? it made for some very bad choices by both of them. We gave away most her things. Sold some. Then basically a company came in and threw the rest in a dumpster. That’s how it ends. It was one sad day for me to watch. Knowing it could have all been avoided. Hi Tim – What you described is pretty much the situation with my mom as well. As is typically the case for homes occupied by the elderly, there had been no major upgrades in 20 or 30 years. The house was also falling down around her. Same outcome too – we ended up selling the house to an investor at a greatly reduced price. He gutted it and sold it at a premium price. Had my mom sold the house when we told her to do so, she would’ve come out with an additional $200,000 plus. But like your mom, she thought we were trying to throw her out. In the end, she’s the one who suffered most by her delay. But we can’t rewind and fix that. But getting back to your point about expectations…I read an excellent book on the baby boom generation. The author said that despite all of the changes that the generation ushered in, in the back of every baby boomers mind was a picture of a perfect life, with 2.7 children, and a house in the suburbs with a white picket fence. He was alluding to the 1950s version of the American dream. He said that even while many baby boomers didn’t actively pursue that lifestyle, they nonetheless continued to harbor it as a standard of how life should be. I think this explains why so many in our generation seemed slavishly devoted to that vision of the perfect life. The 1950s are gone forever, and we all need to come to grips with that reality. I’m also of the opinion that the next 20 or 30 years are going to look very different than the past 20 or 30 years. People are afflicted by “normalcy bias” and can’t see change even when it’s obvious. They assume that what’s always been will always be. The history books make it clear that major change comes on the world at least once every human lifetime. Those who see the changes coming, and adjust accordingly, can thrive. Most of the rest will join the growing ranks of America’s “victims”, under the misguided notion that life comes with any guarantees. This is an aside, but I believe that part of the reason why the Bible and faith have fallen out of favor is because it tells us just this. From God’s own lips, we are guaranteed nothing in this world – which is why we must trust in Him. That’s very unsettling to people who prefer the illusion of security, and the fantasy that they have absolute control over their own lives. I believe that we have some control over our lives, but it isn’t absolute in the sense that the culture likes to convince us we have – usually in the hope of trying to sell us something we wouldn’t otherwise buy. Kevin, can you please tell me the name of that book you just referenced regarding the boomers? Also, thank you for that word “normalcy bias” which I never heard before but completely understand the concept. It’s helpful to have an explanation for it and helps to create a clearer picture for life preparations. And thanks to everyone here who shared their stories. Helps me more than you know. Sure Bev, it’s Great Expectations: America and the Baby Boom Generation, by Landon Y. Jones. It was actually written back in 1981, but it does a superb job of explaining the generation as it was moving into adulthood. Yes, as soon as I became aware of normalcy bias a few years ago, it resonated immediately. It explains why people cling to outdated ideas and behaviors. It also helped me to carefully examine my own biases, and become purposeful about moving against them. Thanks for that link to book, I put it on my wishlist to get as an ebook unless I change my mind and get it as a book to pass on to my sisters to read. I have been fighting that normalcy bias, for years. After being forced to move and lose property because of a fire, I’ve learned to deal with a different normalcy. Our parents came from times when possessing material things was the aim (house, car, etc.). Our wages have been stagnant for years, yet prices of everything has gone up. ( I won’t go into details but we all know what. ) Problem is that those enterprises which do succeed (like Silicon Valley) have forgotten what it was to just get by on a low salary, just take a look at housing problem there. We need to develop a new version of the dream–covering the basic needs– a roof over our heads, food, health—without needing to be dependent on whims of government. It will have to cover all versions of doing this as some of us will want to maintain a sense of apartness from others, while others will feel that sharing with strangers is okay. Let’s take this Thanksgiving (which by the way, was not considered a national holiday until Lincoln decided we needed a national day to give thanks, and is still, by some ethnic cultures here, considered a non-holiday, which is why retail stores are open for business) to think with depth on this subject to either continue this conversation or develop a different conversation. Hi Maria – Part of the reason I frequently argue against “normal” is that I’ve experienced many changes in my life, some voluntary, some by necessity. What I’ve found is that we can survive in any number of different settings and circumstances. Sometimes we defend the status quo in our lives but don’t realize that we’re hurting ourselves by doing that. Most of the changes I’ve made in my life have worked out for the better. Some not so much, but that’s the chance you take, and I’m willing. What I like is when I see my kids doing the same thing. It makes me feel like there’s hope for them, because they refuse to be held down. Maybe that’s one thing I got right with them. I’d rather take a chance making constructive changes than to sit around and be run over by circumstances. It’s become fairly normal for me to make changes. You can do that when you realize that you’re not doomed by change. My faith plays a big role here too – I realize that God will be wherever I go, so I don’t need to be afraid (OK, I am anyway much of the time, but I’m human). We have to do this too because we’re not going to get any help from the government or anyone else. That means we have to think outside the box. I’ll have more posts on these strategies going forward. I’m interested to throw ideas out, and to get feedback from all of you. Regarding Thanksgiving, I always feel I have a lot to be thankful for. I’m not rich or good looking, and I’m certainly not the most talented person around. But I’ve been blessed with skills, people, attitude, and circumstances, and I never want to forget any of it. All any of us can do is the best we can with what we have, and I’m feeling like that might be one of my better “talents”, if it’s possible to say such a thing. We all have plenty to be thankful for. Sounds like we have the same life aside from maybe career paths. I suspect we share the same experiences with probably half of people are age. Hi Tim – One of the VERY unfortunate situations we have here in America is a lack of shared experience. Whatever we face we think we’re facing it alone. It often seems as if we’re the only ones with our problems. But when we open up and share, and position ourselves around others who also share, we find incredible commonality. That’s one of the blessings of the internet. We don’t even have to meet each other, but we can swap problems and solutions. That’s pretty much how I got into blogging. People have helped me who I’ve never even met and probably never will. It makes me realize that there really are a lot of good, level headed people out there, if only we can find one another. That means a lot in a world that’s slowly slipping into madness. I don’t meet people that I have much tolerence for. I last 5 min with most, then I’m looking for an exit. LOL. It’s nice to see that their are like minded people out there somewhere. I think it’s because fools and fanatics are so single minded, while more intelligent people harbor doubts based on the ability to perceive the many possible outcomes. So much that is said on this blog makes so much sense! My husband and I have been chasing the American dream since we got married 39 years ago. We were 18 and 20! Sometimes it worked out sometimes not. I feel we’ve been chasing something that worked long ago but not now. The last recession killed us and we lost everything!! Starting over with nothing in our 50s! But we have a great marriage and 3 wonderful daughters so anything over that is gravy!! We know now we will have to work in retirement but I’m thankful!! Terri, your comment, “The last recession killed us” speaks volumes of an untold story. Millions of people haven’t recovered, despite all the official statistics proclaiming prosperity throughout the land. Millions have had to accept a hollowed out version of the American Dream, and we’re told that all we have to do is trust the system, keep working hard, and we’ll get there. That’s pure propaganda. But when people hear a lie repeated enough times, they eventually believe it. That’s why I largely tune out the mainstream media. They all spew out the official line, and bring up economic troubles only to the degree that it supports the class warfare story – another official narrative. We have to block all that out, and focus on creating new lives with the resources that we have. That’s what we’re working on with this blog. No help is coming from The System, it’s squarely up to us. In a way I think that’s even a good thing. As we succeed in improving our own lives, we’ll gradually begin to realize we aren’t powerless. That’s one of the surprise revelations I’ve come to understand. But we have to get past the belief that the transition will be easy or comfortable. It may mean casting off some of the trappings of the American Dream. But so be it – creating a rewarding life is a lot better than having a bunch of stuff that mostly makes the declaration that you’ve “arrived” in life. Kevin it is nice to be able to blog with like minded folks! I think the times are evolving towards a depression era, and we need to prepare for a life of less. We can create our lives to be affordable and satisfying. Home is where your heart is, not materialistic things. Sure it hurt losing his pension and my 401k after 54. The media makes it sound like we (our generation) never had plans or savings. We shared with our children our concerns as friends don’t seem to realize the economy is faltering. We have read a lot online to educate ourselves better and plan to keep working, smarter not harder, while aging. I agree Deb, we’re heading for a depression era, and it may already be underway. The middle class is being gradually worn down, and few dispute that any more. But the officialdom is unlikely to admit to a depression until the top 10% get hit. That’s not happening right now, so they feel comfortable ignoring the plight of the middle class. I also agree that it has less to do with not saving money. The basic cost of living is rising much faster than the rate of inflation, and certainly faster than wage increases. Healthcare alone is a runaway train, but it’s only one example. Property taxes, utilities, education (including public schooling), repairs of any type, are all becoming progressively more expensive. You save money, but then you get hit with a $6,000 medical deductible or a $2,000 car repair, or $8,000 to replace your roof. It’s much easier to drain savings than it is to replace them. The solutions of course are to find unconventional ways to make a living and alternate living arrangements that don’t cost as much. Not easy, but doable. It’s almost as if you a have to choose to be rich or poor, but you can’t be in the middle. I always tell my kids to work to be rich, but live like you’re poor. You’ll get there faster, and you won’t be so dependent on the common standard of living. This is the bill of goods that we’re sold to are generation Deb. Your husband and you are not alone. Get yourself into a 401K. The what was shoved down our throats. This has been nothing short of a disaster for many people. It plunged ordinary people into being investors. Most people we’re not trained for that. So what do you do? You hire a financial planner. The problem with that is they only sell you products that their particular company offers. The other problem is, they have no skin in the game. It’s not their money. They usually collect their fee no matter how your investments do. They should only get paid if they make you money. If you have a down year then they don’t get paid. It’s not like that though. The other issue is that we don’t have a sound currency. Because we are not on the gold standard anymore their is nothing tied to paper. It’s free floating. Not worth the paper it is printed on. It only works because people still have confidence in it. It creates boom and bust cycles. It’s not too late. As long as your breathing it’s not too late. Good stable, sound savings can still be done. No debt. Their is always hope. I fell for you. You are in no way alone and for sure do not feel like a failure. Most of us we’re set up for failure a long time ago. “Most of us we’re set up for failure a long time ago.” I liken it to climbing a ladder that’s leaning against the wrong wall. I want to endorse what you said Tim, “good, stable sound savings.” We have to save money despite the obstacles. But we have to be realistic about what we can accomplish. My worry is that people with small amounts of savings will load up in the stock market, just in time to get clobbered by the next downturn. It happens in every bull market. Thx Tim We did get financial advice. Plans now are, aging in state close to family, working as long as possible before touching investments/savings or applying for social security. No beliefs here of an utopian retirement. There’s a book that I read a long time ago. I am now rereading it. It’s called a guide to buying gold & silver by Mike Maloney. I know you like to read. Don’t let the title fool you. It gives a history of what fiat currency is. The difference between currency and money. They are not the same thing. He goes through all the myth’s about what we believe to be money. What fractional reserve lending is. How inflation works. I always believe that if we all understood how and why the system is set up for failure and why it fails it is a good starting point to change how you think and invest. Not that you don’t know. I’m not nor would I ever say that. I believe you to be a pretty smart guy. it’s just something I think would benefit all readers. I helped me a great deal many years ago. I have followed it’s general advice for year’s now. Hi Tim – I’ve been a fan of Doug Casey since the early 1980s, so I’m well acquainted with the fiat money system. It’s the reason why we have inflation and why we’ll always have it. It’s also why the middle class can’t get ahead. I won’t write an article about it because most people’s eyes would glaze over after a few paragraphs. Not one person in 10 has an idea this is happening, and maybe one in 50 knows the implications. The government doesn’t talk about it, even though it’s how they operate. The entire monetary system is corrupt to the core, because it’s driven by politics, not economics. It’s also why the government never runs out of money, despite deficits. I did discuss this some in a previous post on the stock market, but I don’t think I delved specifically into the fiat money system that dominates all currencies today, including and especially the US dollar. But it’s the source of most of our troubles. Yeah, I know. I get it. I should know you would get it though. I always pray more people would be open to learning this stuff. It never seems to happen though. “Why do you think not a lot of people seem to want to understand it” – It’s certainly not taught in the schools, but it’s also behind the scenes. We’re all subtly taught that if it’s behind a curtain, we’re not supposed to know about it. Also, there’s the false god phenomenon – people assume that if it’s by/from the government it’s basically good and necessary. I don’t even know if a lot of bankers understand it. I find it very funny when I see people on TV protesting about stagnate wages and all the money issues because they are not getting what they need. The problem is they are protesting to the very entity that is the root of the problem and the very cause of it all. One of the facts of today is that people usually get worked up about and protest against the wrong thing. For example…Tax Day Protest – More Proof America Is Delusional. I think they’re being manipulated into it by the media. We live in a world of mass distraction, and I don’t think it’s accidental. I’m not sure. I have a few thoughts but they are just my opinions. We had it so good for a long time that I think most people never questioned anything. Why should they. We had a strong middle class. People we’re able to buy homes. Feed their families and have nice things. So When you have it like that I think we all have a tendency to think everything is fine. The government must be doing the right thing, otherwise we would not be living this good. We haven’t done the right thing for a long time so it’s finally catching up to us. I really believe we are done as a nation. I think this country is going to look vastly different in the next 20 years. Are financial system is a complete sham. It’s been for a long time. It’s designed for us to fail. All through my 20’s I made 90,000 a year, sometimes more. I had nothing. I could not get ahead. I knew it wasn’t me. I knew in my heart something was wrong. That’s when I decided to educate myself on these things. What I read and discovered once I let it sink it changed the way I did things. I am so much further ahead now then I ever was back then. If I would have stayed on the course I was taught I still would be sitting here scratching my head. My hope when I write these things is that people would question things and open themselves up for change. It’s hard to do. It will never be taught in schools. Their mandated by governments. They very governments that cause the mess. Of course they don’t want you to learn. They want you sitting at home watching netflix. Fighting about race. Beating each other up on black Friday for a big screen TV. We feed right into it. I do really think the younger generation now sees better than we did. i feel for the people who are our age who sit here and wonder what the hell happened. We’re starting over at 50 trying to rebuild are life because everything we learned was a lie. I’m sorry. I am nuts about this topic. I see it too Tim, but I try to redirect the negative energy into positive. With the exception of the post-WW2 years 1945 – 1999, life has never been easy for the average person. There usually wasn’t even a middle class. That’s going back to Biblical times, and probably well before. We’re drifting back to that same condition. We can’t change the big picture – even voting is a near worthless exercise, designed to make us think we’re participating. The only thing we can do is control our own reaction to what’s happening. That means changing our attitudes and behavior in response to work, debt, education, retirement and lifestyles. The real problem for most people isn’t the decaying economy. It’s that people aren’t reacting to it accordingly. They’re buying into the happy narrative offered by the politicians, the mainstream media and the entertainment industry. That keeps us consuming, getting into debt, and building lifestyles we can no longer afford. Breaking out of that cycle is the key to it all. And as I’ve said before, once you do it’s empowering. You realize that you can survive and thrive by NOT going with the flow. It’s also a way to reclaim our individuality. Our culture has become way too homogenized since WW2, and that isn’t benefiting most of us. This is a time when each of us need to reassert the individual in all of us, and to let our best qualities come to the surface.